Over the years, I’ve collected a nice little library of books on the sport, but one thing that’s been missing has been a section on cyclocross. Oh sure, I have Simon Burney’s classic book Cyclocross: Training & Technique, but that’s the only book I’ve ever seen on cyclocross prior to two new releases this year: Geoff Proctor’s Behind the Stare: the pulse & character of European profession cyclocross, and Molly Hurford’s Mud, Snow, and Cyclocross: how ‘cross took over U.S. cycling. Needless to say, I jumped on both books as soon as they came available and devoured them as quickly as possible. 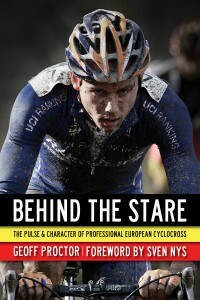 Since the focus of the book is on cyclocross in Europe, it makes sense that most of the book centers on the stars of European cyclocross: Belgians Sven Nys, Erwin Vervecken, and Bart Wellens, but Proctor also has chapters on American stars Jonathan Page, who has most of the last decade (at least from September through February) based in Belgium racing cyclocross fulltime, and Ryan Trebon, who has long been one of the United States’ top domestic cyclocross racers. While the profiles and race reports were enjoyable to read, here’s where the book breaks down. Since it took so long to be written and published after Proctor’s time in Europe, it feels dated. Rising star Jeremy Powers, and veteran domestic pro Tim Johnson are not discussed in great detail; and of the “new guard” (Niels Albert, Lars Boom, and Zdenek Stybar) of cyclocross that Proctor writes about, only Niels Albert is still focused on cyclocross, whereas Lars Boom and Zdenek Stybar have both transitioned to road racing. An enjoyable read, but it left me wanting more. MUD, SNOW, AND CYCLOCROSS (Molly Hurford) almost has the opposite problem. While it does focus on cyclocross in the United States, and does discuss how the sport began to grow in the United States in such hotbeds as New England and the Pacific Northwest (notably Portland, Oregon), it felt like it was geared almost exclusively as a preview leading up to the Cyclocross World Championships, which will be taking place in Louisville, KY in February 2013. 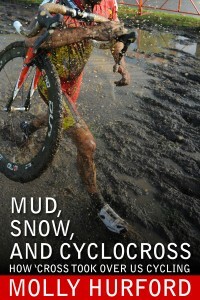 Where I do commend Hurford’s book is on her chapters dealing with women’s cyclocross. They focus not only on riders like Katie Compton, Amy Dombroski, Mo Bruno Roy, and Nicole Duke, but also on how cyclocross is one of the only disciplines in cycling striving for equality, especially with regards to prize money at races. She also writes about some almost unique qualities of American cyclocross, such as beer and dollar hand-ups, the popularity of singlespeed ‘cross – and the tattoos that come with winning the unsanctioned, but widely recognized Singlespeed Cyclocross World Championships, and tips for new cyclocross riders from the pros. This book was another enjoyable read, but as alluded to previously, feels like it will rapidly become outdated after the World Championships this next spring. I guess what I was hoping for from both books was a more in-depth study of the history of the sport, and profiles of not only contemporary riders but of the stars of the past. Where I was looking for a meal, all I got was some very tasty appetizers, which left me hungry for more.